Heat oven to 450°F. Bake pie crust as directed on box for One-Crust Baked Shell, using 9-inch glass pie plate. Meanwhile, in small microwavable bowl, place almond paste and 2 tablespoons of the whipping cream. Microwave uncovered on High about 30 seconds or until almond paste is softened; stir until smooth. Spread almond paste mixture over bottom of warm pie crust. Cool 45 minutes. In small bowl, mix gelatin with cold water and lemon juice; stir with fork to soften. In 2-quart saucepan, mix 3 cups of the raspberries and 3/4 cup sugar; add softened gelatin. Cook over medium heat 6 to 8 minutes, stirring constantly, until gelatin is dissolved and mixture is warm. Refrigerate until cool, about 30 minutes. In large bowl, beat remaining whipping cream with electric mixer on high speed until soft peaks form. Gently fold raspberry mixture into whipped cream mixture. Spoon mixture over almond paste mixture. Refrigerate at least 2 hours until chilled. In medium bowl, place remaining 1 cup raspberries, 3 tablespoons sugar and the juice concentrate. Crush raspberries with fork and stir well to dissolve sugar. 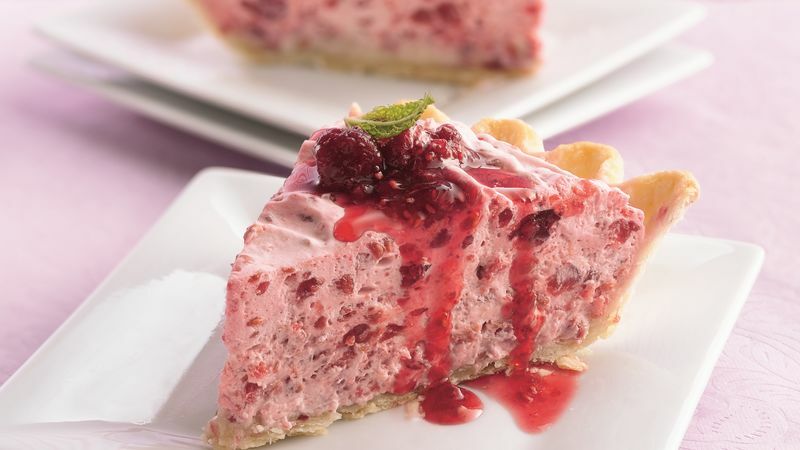 Drizzle crushed raspberry mixture over individual servings of pie. Garnish with fresh mint. Cover and refrigerate any remaining pie. The raspberry mousse is also delicious served in chocolate shells or in parfait glasses. Frozen unsweetened strawberries can be substituted for the raspberries.